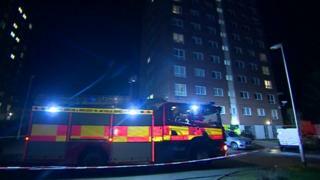 A man in his 80s has died in a fire in a seventh-floor flat in Kidderminster. He was pronounced dead at the scene at Coniston House, Hurcott Road, on Friday, police said. Three other people needed hospital treatment after the fire, which was not thought to have been started deliberately. West Mercia Police said a man, woman and child suffered smoke inhalation, but their conditions were not thought to be life-threatening. Hereford and Worcester Fire Service previously said the fire on the seventh floor had been extinguished within an hour of it being reported, but firefighters remained at the scene damping down.